A friend of mine has gone through some hard times recently, and now that they are behind her she asked me if I had a ritual to help her let go of that painful period in her life. I love the use of rituals in our lives. Rituals cause us to take pause, giving weight to things that are significant for us. They help our brain focus and pay attention, and they help us orient ourselves emotionally and spiritually. 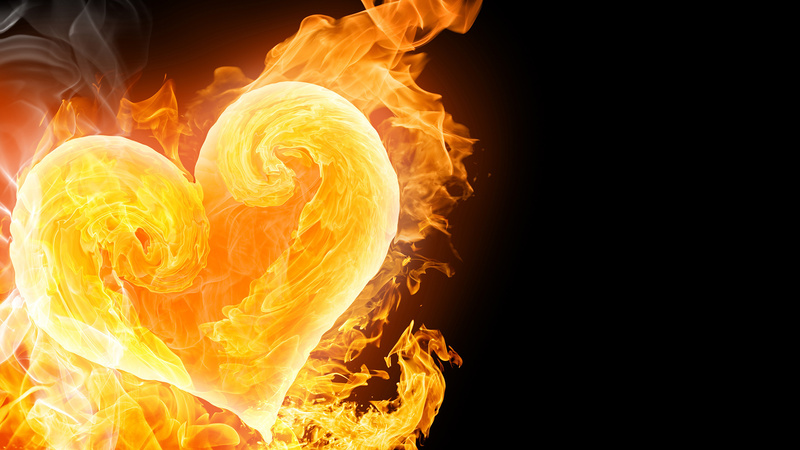 Burning has long been used as a ritual of release, so today I’m going to show you a simple burning ritual for cleansing and releasing situations and relationships that have caused you pain. Burning Equipment – a large flame-proof pot or bowl, or an outdoor fireplace. Matches. Long tongs. Don’t use one of your good bowls or pots! Go to a second-hand store and find a big old saucepan or cauldron, or see if you have an old brass or metal bowl in the back of a cupboard. You could also use a barbeque pit or a campfire, or a terracotta pot. Be sensible about your burning. Burn outside, observing fire restrictions and keeping your fire away from anything that might catch alight. Gathering Your Burning Fodder – Never burn in the heat of the moment! A calm, thoughtful and considered burning is much more powerful and effective. Begin by finding images, letters or other material related to the situation. Don’t burn any legal documents. Don’t burn anything out of spite. All you are looking for is material that can REPRESENT what you wish to release. For example, old photographs or letters, old newspaper clippings or advertising – anything that holds emotion for you and that you can afford to send up in flames. If you have no images or material, then sit down and write a letter to the person or persons involved, or a summary of what has gone wrong and what you wish to let go of. You can burn alone, or you can burn with friends or loved ones. Choose what is appropriate to you. Sit in front of your pot or burning space, hold the images/paper in your hands and just speak from the heart about what this represents to you and why you need to let this go. Finish with the words I release you. I am done. Then burn that stuff to ashes! Feel the flames eating up and rendering that old energy into nothingness. Let it all go. That’s why we need to do this ritual outside, where the old energy can escape and be diffused on the wind. You don’t ever want to do this ritual INSIDE your home – you want that old energy gone! Honour any emotions that come up for you, but allow the ritual to give you a sense of finality. When it’s cooled enough, dump your saucepan in the bin or keep it in the garage or garden at home for future burning needs. Celebrate the end of the Releasing Ritual with a beverage or some food – head out for a meal, or go home and have a cup of tea or a drink. Allow yourself reflection time, to recognise that you have closed the door on that part of your life. 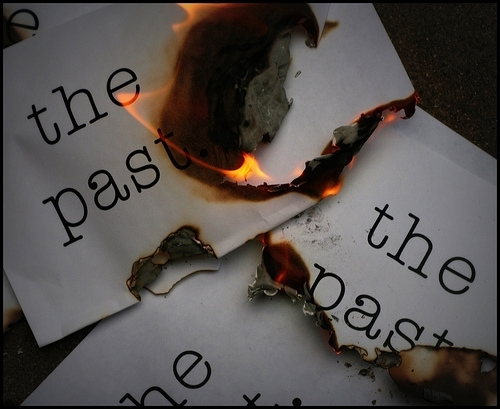 In burning the past, you leave yourself free to claim a brighter future. This entry was posted in Coping Skills, Ritual and Ceremony, Soul Growth and tagged burn the past, burning ritual, coping with failure, defeat, divorce, emotional pain, emotional release technique, empowering your choices, grief, healing, healing rituals, loss, mental-health, relationship endings, releasing ritual, rituals, survival skills by Cauldrons and Cupcakes. Bookmark the permalink. One of the approved ways of disposing of a Koran is burning it, and letting the ashes go into a river. A friend gave me a beautiful book of handmade paper, and I wrote my poetry in it. Twelve years later, I realised that poetry carried a great deal of shame around my transsexuality, so I burned it over a stream, and let the ashes float away. Because of the fairly thick cover I could hold it as it burned. It had served its purpose. At our midsummer camp, we have a burning ritual in the bonfire, anyone putting something in to represent the things gone. Last year I wrote the word “negativity” on a piece of paper and burned that. It was acknowledgment of a change rather than making a change. A friend and I, here in the United States wanted to farewell Saturn from our star sign of Libra. We had both felt the effects for the last three years and were happy when the planet finally left our on the fifth of October. Together we wrote a list of the things we were happy to see the end of and happily folded our little pieces of paper together. We burnt the offerings in little leaf rafts and sent them off on the shores of the bay in Sausalito. We celebrated afterwards with a drink and a hug. We were so glad to see the end of that planetary phase! I love this post, Nicole! Once, a long time ago, following a horrible break-up, I took all my photos and letters to burn at the beach. And being a New York City beach (Coney Island), of course, I attracted the attention of the NYPD. Two cops on dune buggies zoomed out and started yelling at me that no fires were allowed on the beach. So immediately I started crying and telling them about my crap ex-boyfriend and how I just wanted to get rid of this stuff in a final and cleansing way. One cop looked at the other, paused, and then just told me to make sure I dumped a bunch of wet sand on the pyre after I was done. YES! This is something I’ve had to do, especially since clearing out my mother’s apartment, in addition to facing some of the more painful memories while doing so. We all need to permit ourselves to set our pain afire, and release what we’re carrying with the smoke as it wafts up and away from us. After a very very ugly Christmas Eve last week with my family, and so much uglies with my husband about the past three years, I am going to do this tomorrow night for my New Year! Its time to set it all afire and let it all go. Can I do this in my backyard or does it have to be off my property completely? I had written my “release” letter to a former friend and was looking for a burning ritual to make it final, in a more formal, symbolic way. It is below freezing right now, but I am going to get into some warm clothes, get some matches, and head out to the firepit in my backyard. Thanks for sharing this post. It was exactly what I needed right now. Have just found you the night of the blue moon,have had nearly 3 years of family pain from 3 children been pushed out of all.Will now do burning the past,thank you so much all made sense comes when you need it.capricorn with libra rising and capricorn moon. Marie. It is one night past the full moon (crone-full) and still light outside tonight. The clouds are dramatic rather like the way I feel. Fourteen years have been consumed by this woman who started out as a psychotherapist and before my eyes morphed into a lover–well almost–and that is a part of the problem. When I met her I was very lukewarm about her, wanting to seek someone else but with a shortage of therapists she was it. A few weeks into therapy I became very attached to her and instead of being a professional about this, she moved the “therapeutic” relationship along intimacy lines. In the background and unknown to me, was a divorce fomenting between her and her estranged husband. I was blindsided by it when it finally broke. When he left I was immediately (and uncomfortably) incorporated into the family which consisted of me and her and her 9 year-old daughter. She psychologically played the child against me and me against the child keeping us both unbalanced and anxious, never really able to trust each other or her. There were so any lies and nuances and double roles, all meant to keep me near while using my talents and emotions to move herself forward in her life. Yet I believed, perhaps this too was a psy-op, that we loved each other and would make a life of it when she finalized her divorce. We would focus on healing and helping her daughter over the hump. One day in May 2009, after a trip together, she got out of my car, yelled F**K you and threw a package of crackers at me, hitting me in the head. That was the last time I spoke with her. After much encouragement by my inner Self, I consulted another therapist and ultimately an attorney. The state where I live investigated my allegations and the investigator told me it was the worst psychotherapist-client abuse case she had seen in the 25 years of her job investigating licensure claims. Ultimately her license was revoked, a civil suit completed, and a move to another town. Just yesterday, when taking a new friend home from the cafe, I had reason to drive down the street where she lives (something I normally avoid). I was shocked to find her house vacant and up for sale. In an instant all the memories, good and bad flooded back on me. I have not been able to shake it, seeing images in dreams and waking. Thus, in search of an ending to this re-trauma I knew I needed to do something in a ritualized and conscious manner to finalize and be shed of this relationship. I have tried many times to talk about my experiences and have gone through several “light weight” therapists since, all who became afraid for their licenses as if I was some sort of pariah because of what happened. ‘Therapy’ became about them, not me, and useless to my healing. I have just muddled through for six years–until now. When I found this site and read the ritual and the many comments I began feeling like I was in good company and that I had invisible friends who are on my side as I work through this most recent experience. I will end now, still feeling your-all presence nearby, and head for the back yard and the last night of the three full moon nights. Many thanks for the work you put into this site. It has helped. THANK you! I’m definitely going to do this … especially after grieving for 25 years, a relationship that completely ruined my life. I should’ve done this LONG ago! I just sat down and wrote a letter to my ex a few hours ago and I want to burn it but I dont have a place to burn it outside only inside in my fireplace. Now with that said what if I take the ashes outside and let them be carried off by the wind?! Can you possibly take the letter somewhere and burn it? Just take a ceramic bowl, lighter, and oven mitts with you. And possibly a stick to stir it all together. I’m not the author nor am I a professional, but I think outdoors is best. Pick a nearby park or woods. Just make sure you don’t leave hot flame or ashes and good luck! Setting fires around here is frowned upon unfortunately…..but this is a good idea though. I don’t want to do it inside at all…. I have been carrying shame and betrayal I was raped at the age 13 I am now 61 for the past 10 years I have had daily horrible migraines and live in severe pain. 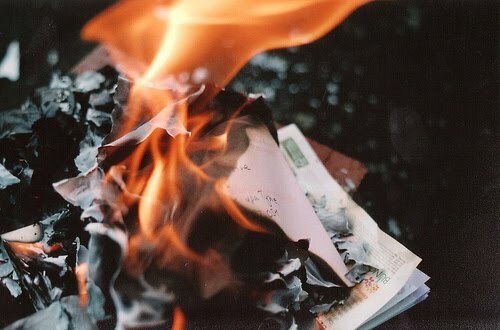 I hope writing a letter and burning it will remove my pain. I’m at the end of my rope . If I could ask will some of you pray for me and my healing I need extra power I have tried everything and every doctor and no results. Thank you and bless all of you out there. Oh my God thank you so much for your help I will get the book you suggested I thank you with all my heart for your kindness and prayers Nicole. I have never heard of it but I will surely look into it. Lori I thank you so much for your kindness Bless you ! for your response it made me feel better. Every little bit helps, Joann! every prayer and every bit of advise keeps me going and renews my faith that there are still some caring and loving people in the world thanks Lori and Nicole for being part of that world . I have dealt with so many selfish, uncaring ,jealous evil people . I am truly a loving and caring person who does my best to love and help people and all I get is hurt and mistreated . I always try to find the good in everyone but I’m finding there aren’t too many that truly are genuine and have a good heart. I can see you now I have found some people who really do care and I thank you and others like you. Bless all of you that care about others and give them hope. I feel much like you, Joann. I used to volunteer, but the last three experiences left me disgusted and discouraged. I won’t go into detail because I don’t have time and don’t want to think about it all anymore. So now, I just give money and pray. Plus, I get a lot of environmental- and animal-rights newsletters and such via e-mail and continue to write letters, make phone calls, and sign petitions. So I help however I can. I just will not join any more groups ever again! I know what you mean I always give people the benefit of the doubt and my mistake is I think people think like me then you find out that they are not genuine at all. It makes me enjoy myself more being alone at least I can trust myself. I like this site because people seem to actually care and have compassion. It’s nice to find pleasant people. Does anyone know who does good psychic readings over the phone? Maybe if some of my questions are answered I can move on with my life. I live on Long Island New York and I don’t know anyone that has psychic abilities. You’re certainly not crazy. Better than taking a baseball bat to the SOB. I want to share my story. I’ve had a few dreams lately haunting me over my ex girlfriend. A friend of mine suggested I have a burning ritual to purge any remaining energy, she said it always worked for her. I decided to burn some pictures and a frame that was a birthday present. Mind you I like to drive ideas home. So I waiting until tonight, which was a calm windless perfect night for a fire. I’ve had a stack of wood ready for a bonfire in the back yard for awhile now and this seemed the perfect way to burn out my demons. I literally the fire tended to it for Abit until it was raging in glory but controlled in the for ring. I said my goodbye, made my peace and burnt the frame and pictures. The second that frame turned to Ash in this bonfire a gust of wind sprung up and spread the fire out into the yard. The fire then took off rather quickly consuming dry grass up the hill towards the garage. I found myself with a hose and 2 buckets battling this raging brush fire. . . I pulled out my phone and considered calling the fire Dept for assistance but quickly realized that I had to fight this fire on my own to complete the ritual. After 20odd minutes of running around the garage up and down this hill with buckets of water (the hose only reached so far) I managed to get the fire under control. I have never felt more satisfied and cleansed in my life. It was a perfect representation of that chaotic relationship. hello, newbie here, what odes it mean if you burn something and it doesn’t burn?